This rant deals with “2nd Shift Happenings,” as a sergeant called them in his informative email, over the past couple days. First: If a department has so many extra grant cars working that I can’t grab enough air time between their traffic stops to dispatch runs, that is a problem. They need their own dispatcher. And I’m not interested in hearing that there’s no money to pay a dispatcher overtime to do that. There was enough money to pay those four deputies overtime. I know that if you complain this much, you should also offer a solution. (I think of my stepfather, telling me, “You kids just want to tear things down, but you never say how to build them up.” He was accusing me of being some kind of communist, when I was actually a wild-eyed Ayn Rand capitalist at the time.) I have no solution. There may not be one. When I started, and there were still a few officers in ye olde Radio Room downtown, an assignment to said room was considered punishment detail, which no red-blooded police officer would voluntarily undertake. Then they discovered that lower-paid and lesser breed of being, the civilian dispatcher, who took on the unwanted tasks of taking calls and talking on the radio, freeing them to do Important Stuff. The more things change, the more they stay the same. Yes, I know I’m stirring up and/or prolonging resentment, and I should just let it go. But I’m not good at letting things go, and sometimes I get tired of trying. I should probably let this post wait awhile and re-read it before I hit “Publish,” but let’s just run with scissors, shall we? They had trouble locating the victim, not the suspect. Apparently SHE couldn’t want around after already waiting 2 hours. In my humble opinion, the root of the problem is no accountability. 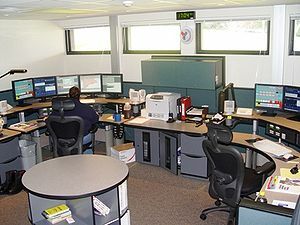 The officers never see us, unless forced to, so they have little to no relationship with the dispatchers. Now, it apparently wasn’t a lot better when dispatch was downtown, so I am not sure. Seeing that the problem comment was made by a sergeant, there is little accountability coming from the supervisors on their end either. I also question some of the admin here and their ability to stand up for the dispatchers in a situation like this. I am not sure they could and I am more sure they just wouldn’t either way. I tend to think I have less problems with this kind of stuff for a couple of reasons. I am a male around the same age of most of the officers I work with. And over the years, I have tried to go on ride-a-longs on my own and get to know some of the officers on their turf. Now it has been 3 or 4 years since I did a ride along, but I used to do a 3 or so a year on my own time. Now as for the officer that called in… he is an idiot, always has been an idiot and more than likely always will be an idiot. Why someone ever thought it was a good idea to give that man a gun and a badge is beyond me, but apparently this city is stuck with him. Great post. Glad you didn’t let it sit first.